Other fats could be substituted for the butter, but butter generally tastes best here. For the small handful of health conscious non-professional home cooks, absolutely do not substitute milk for the cream, otherwise the fat ratio for the recipe will be thrown completely off and your results will be horrifying. 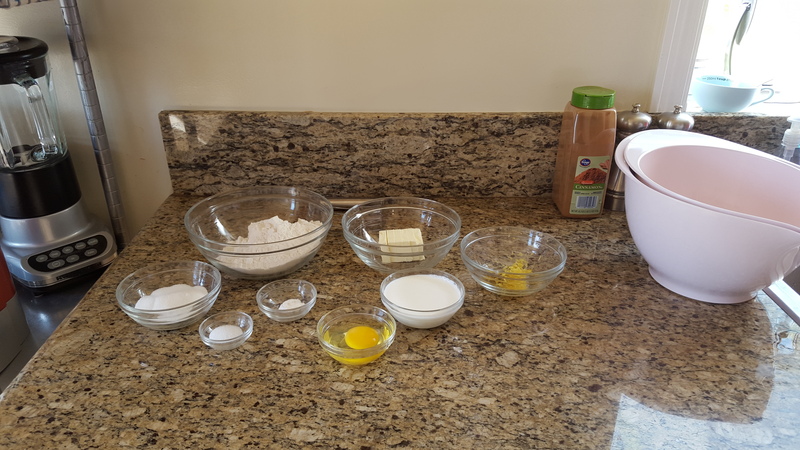 Professional kitchens scaling the recipe beyond 75 oz of flour, may wish to use 1.25 parts of sugar for more even results. 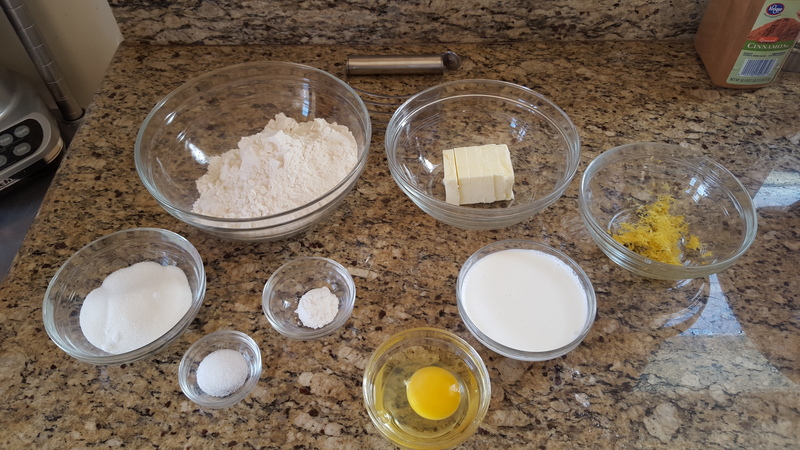 Whisk together the flour, sugar, baking powder and salt until mixed thoroughly. 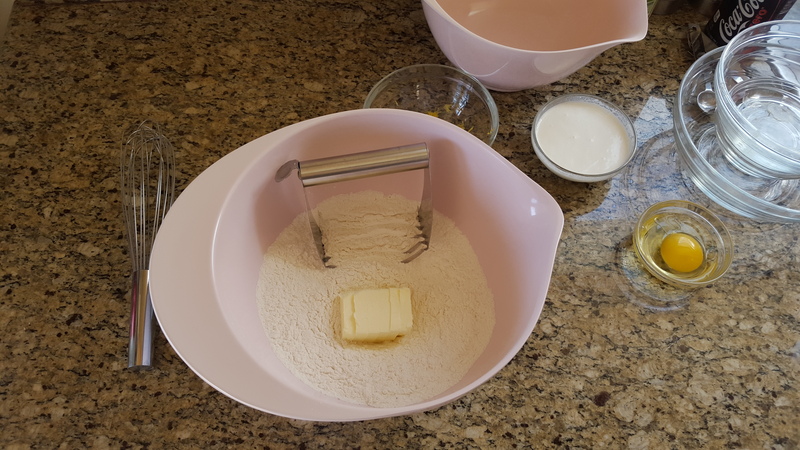 Cut the cold butter into the flour mixture with a pastry blender until the lumps of butter are just larger than the size of a pea. Any smaller and the scones will be tougher and less flaky. 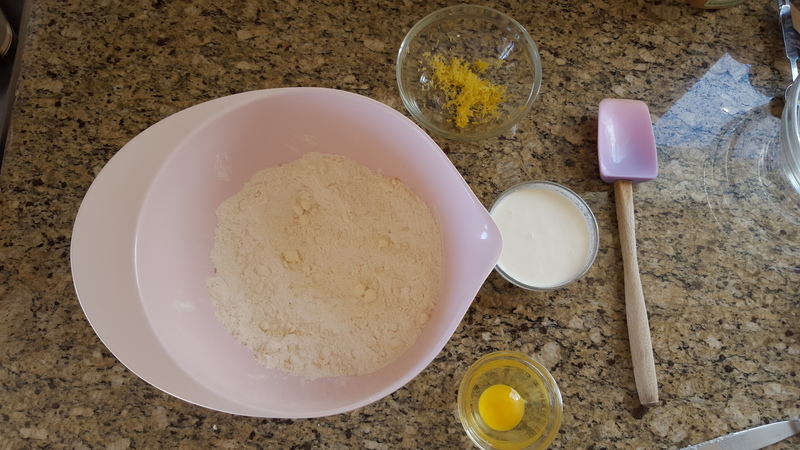 Mix together the cream, egg, (optional currants, raisins, fruit), and the zest, then mix into the flour/butter just until the dough comes together. 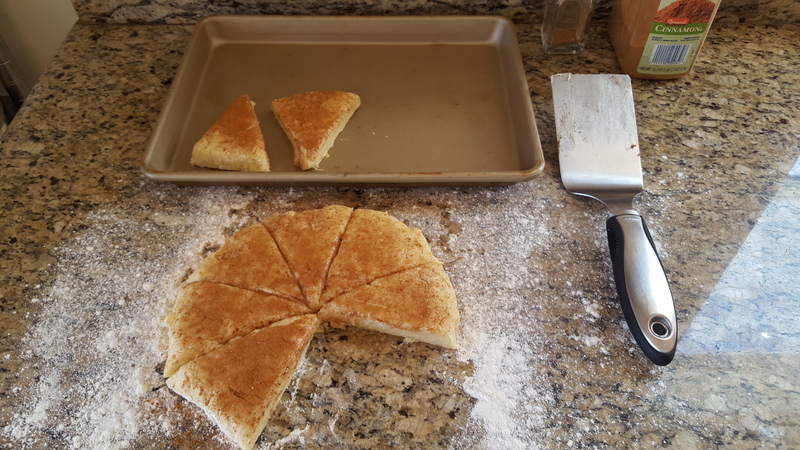 Do not overwork the scone dough or the resultant scones will not be light and flaky. 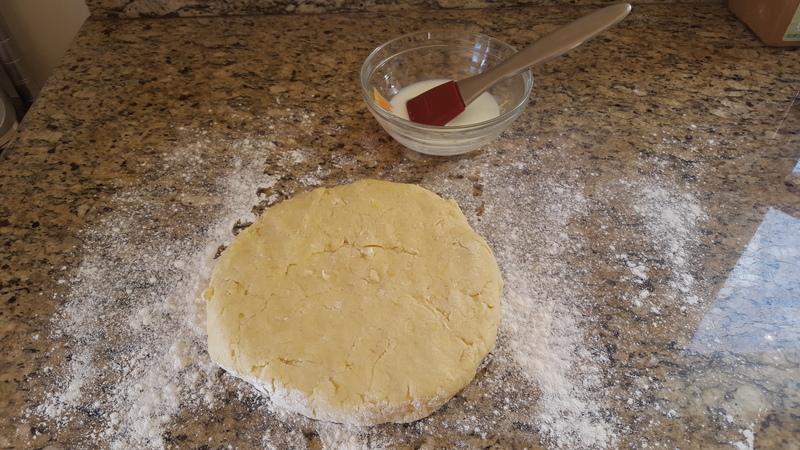 You should preferably be able to still see small chunks of butter in the dough. 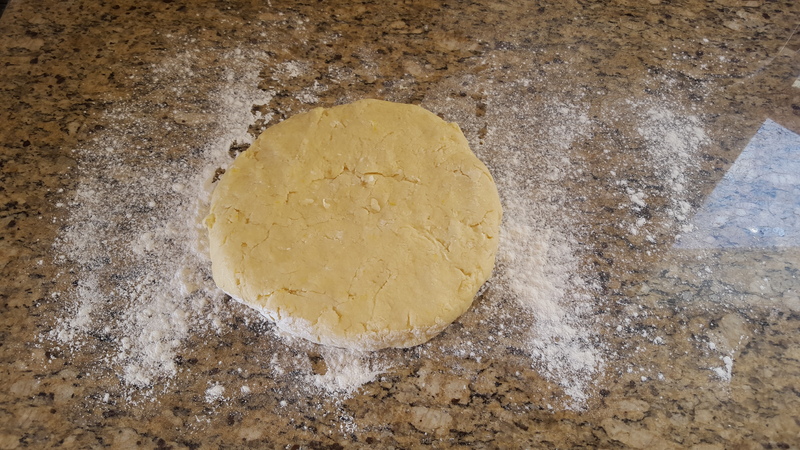 Roll the dough out into a disk about 1.5″ thick. 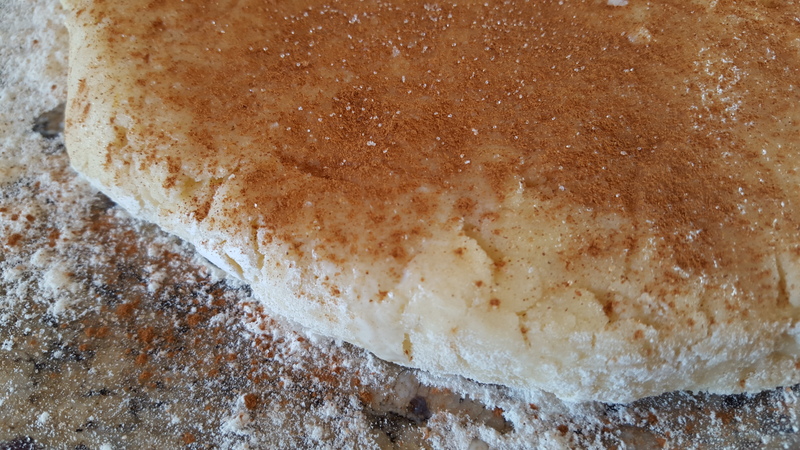 Brush a light layer of cream (or milk) onto the top of the disk and sprinkle on a nice layer of cinnamon and sugar. Using a dough scraper cut the dough into eight equal wedges and place onto cooking sheet. 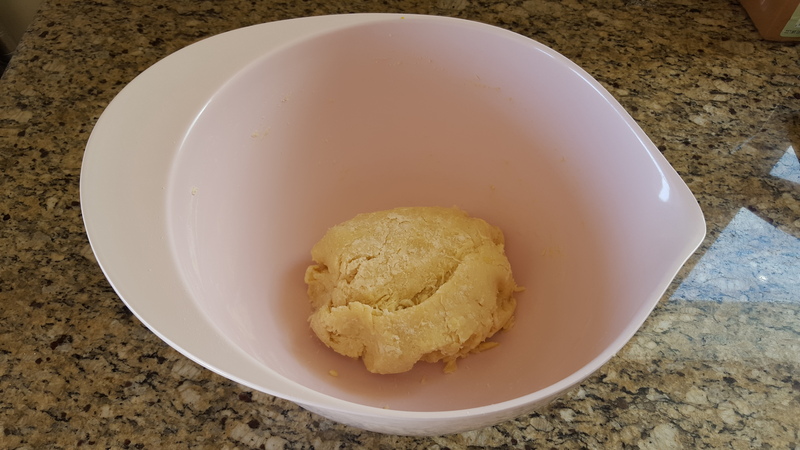 Put the sheet of scone dough into the oven at 450 for 12-15 minutes until golden brown, or until an inserted toothpick comes out clean. Cool for a few minutes and then enjoy fresh with clotted cream and fresh fruit. 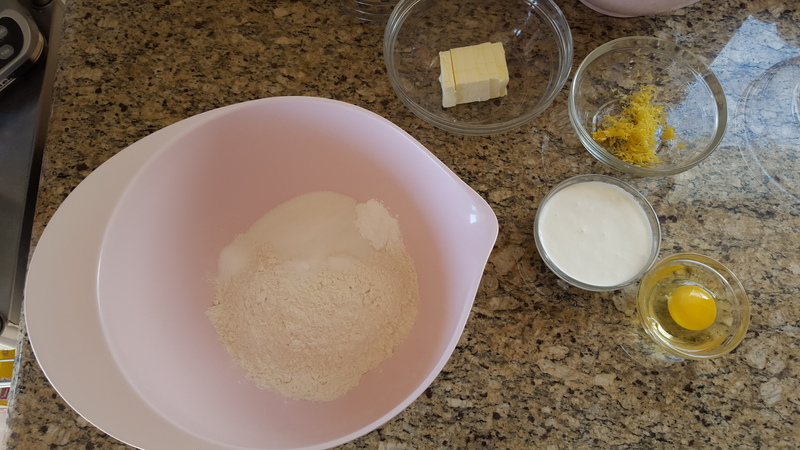 Put the cold butter into the flour mixture. 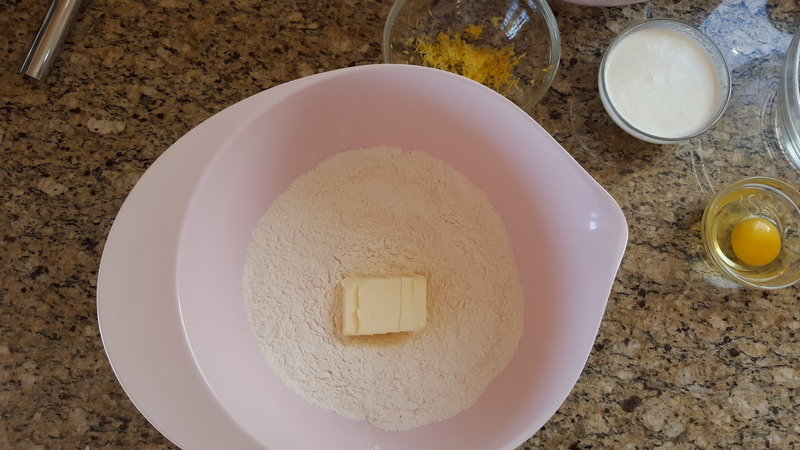 Cut in the butter with a pastry blender until the lumps of butter are just larger than the size of a pea. 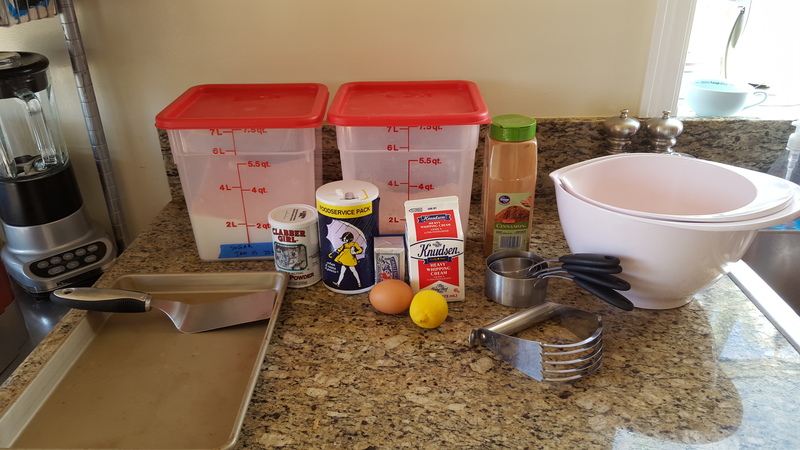 Any smaller and the scones will be tougher and less flaky. 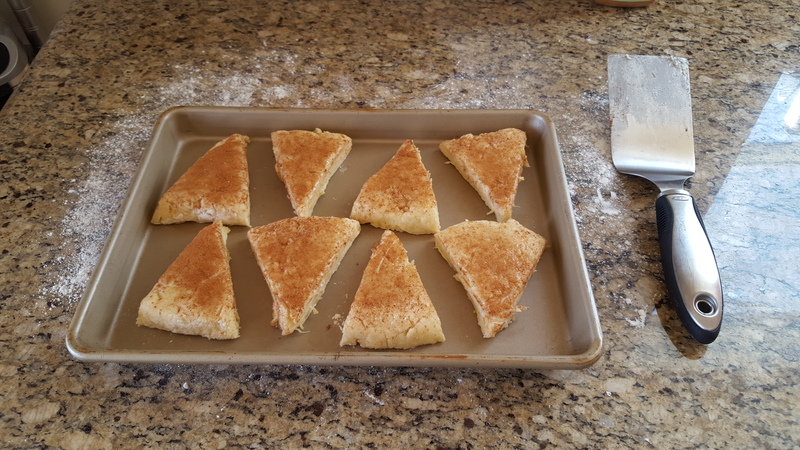 Do not overwork the scone dough or the resultant scones will not be light and flaky. Brush a light layer of cream (or milk) onto the top of the disk. 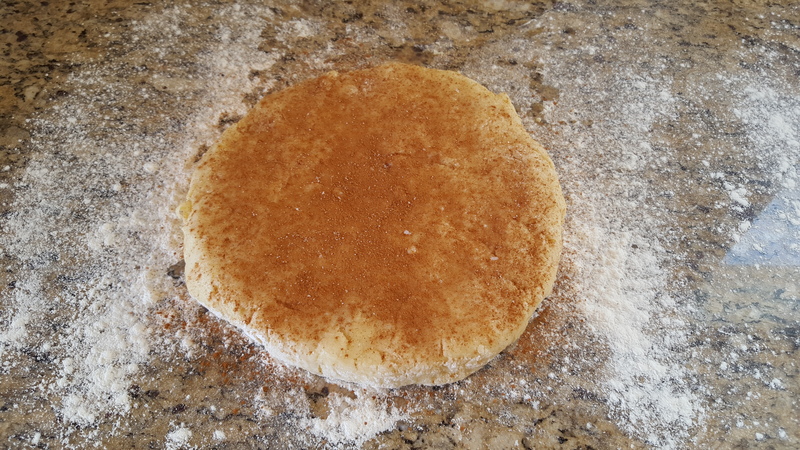 Close up of the dough disk with cream. 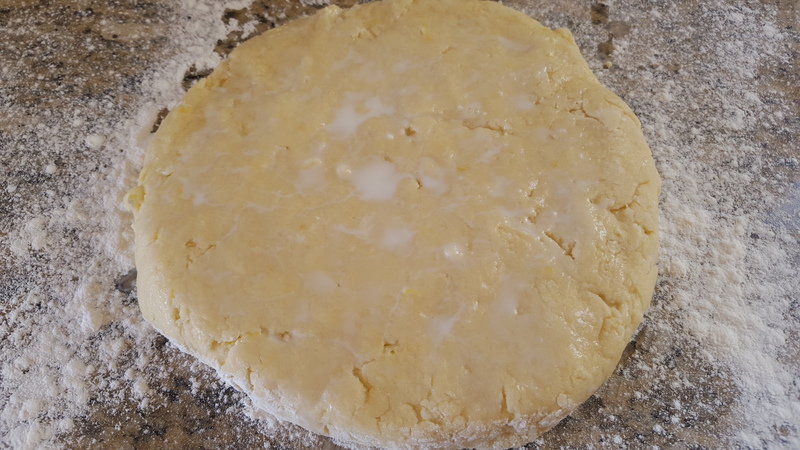 You should preferably be able to still see small chunks of butter in the dough. Sprinkle on a nice layer of cinnamon and sugar. 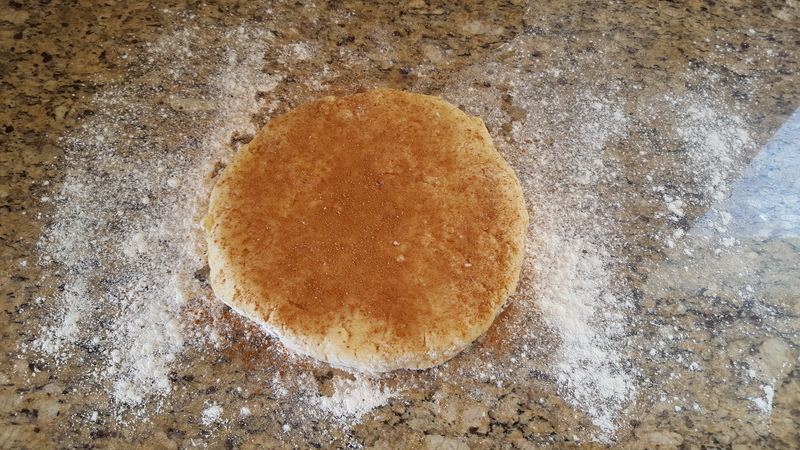 Close up of the texture of the dough.